When we see a little black and white woodpecker at our feeders or working on a tree we often think ‘Downy Woodpecker’. Appropriately so, as Downy Woodpeckers are in much larger numbers than their look alike kin- the Hairy Woodpecker. But who doesn’t want to see a Hairy Woodpecker! Here’s some ID tips for telling the two apart, especially at long range or when they are not next to each other. Downy Woodpeckers are about 6-7″ in length. Hairy Woodpeckers are 9″ or a little bigger. Roughly 50% larger. That difference is substantial at close range, but can be hard to assess at a distance. The bill can be much more of an identifiable feature. A Downy Woodpecker has a bill that is about 1/3 the depth of its head. A Hairy Woodpecker has a bill that is about the same length as the depth of its head. So if the bill is much shorter than the depth of the head, its a Downy. Lastly, check the outer tail feathers. 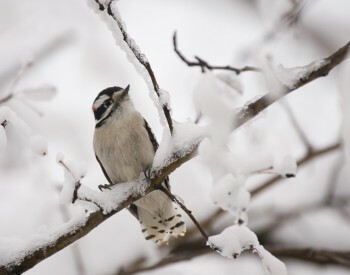 A Downy Woodpecker will typically have dots or lines on their outer tail feathers. A Hairy Woodpecker will have solid white, without any marks, outer tail feathers. While much of their diet consistents of insects both of these woodpeckers can be drawn to the feeders with sunflower chips and whole or shelled peanuts. The best way to attract them to your yard is to provide their preferred habitat including trees and native plants to satisfy their quest for insects. Both are also cavity nesters and rely on timber with sufficient dead branches or dead areas of the trunk where they can excavate their nests. 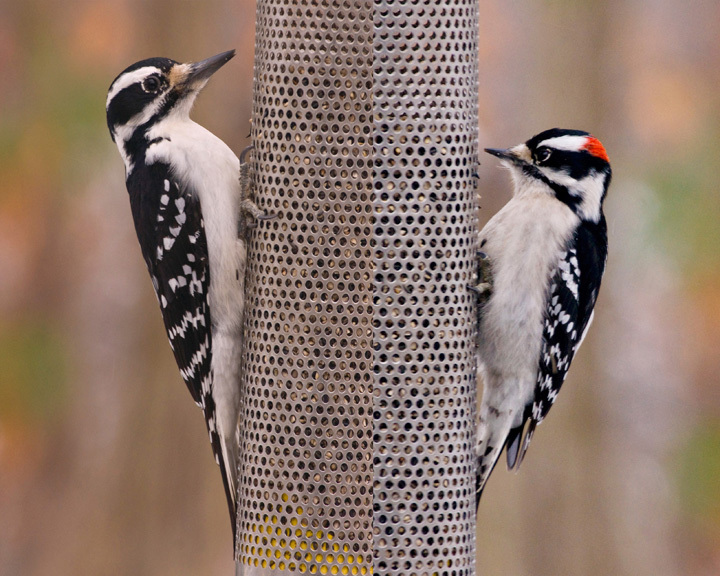 Great feeder visitors and welcome yard nesters in the spring, Downy and Hairy Woodpeckers are a favorite among backyard birds!